Authors: Roth, J. M.; Murphy, T. E.; Xu, C.
Abstract: We demonstrate improved efficiency and dynamic range for two-photon absorption at 1.5 µm in a photoelectron-counting GaAs photomultiplier tube. 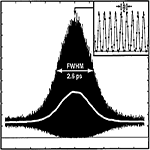 cw laser measurements show pure two-photon absorption occurring in the device from average powers of 1.3 µW to nearly 1 mW. We use the detector to implement an autocorrelator with peak-power × average-power sensitivity of 1.7e-4 mW^2 and discuss practical ways to reduce this figure of merit to as low as 1e-5 mW^2.